Erica’s Texas Wedding Florals — Paper Rose Co.
A year into this business, I'm getting a lot more wedding inquiries and while it's not something I necessarily set out to do, looking back on my experience with Erica makes me realize how much I enjoyed it. I thought I'd share a small look into the process of how these florals came to fruition. Working with me isn't that different from working with a traditional florist—there's just one main exception—I have to make everything first! "I wanted to be able to keep my bouquet long-term, so the paper option was really speaking to me. Plus having the ability to choose any flower in the world! In any color! Talk about freedom to create a bouquet of your dreams." Once Erica convinced me to take on her project, we started by gathering inspiration from her favorite flowers, the gorgeous wardrobe she'd picked out, and the colors we could expect to find at their perfect Texas venue on an Autumn day. She has impeccable style (check out her business! )—so there was plenty to work with. Design-wise, my process began by developing a color palette. I drew inspiration from the paper I knew well—Lia Griffith's line, which I had been using heavily for my 2017 Valentine's Day collection—and blush, bougainvillea, and orange hues from Italian lines which offer heavier weights that I could use to add more structure and support. Once we decided on a color palette, I researched varieties of flowers that would pull in the hues we needed to add. 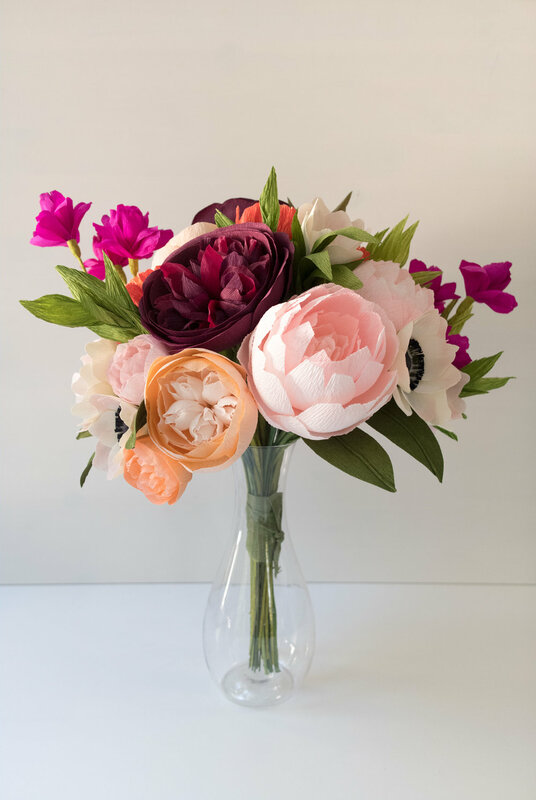 Erica requested the Juliet Garden Roses and Blush Peonies she'd seen me make, and enjoyed anemones, but was otherwise open to suggestions. I brought in bold pops of color and texture with dianthus and mums, but I knew I wanted to add depth (and drama) with a more substantial aubergine bloom. I took to my David Austin catalogs and discovered the Munstead Wood Garden Rose—which fit the bill perfectly. Palette and floral inspiration approved, I was all set to create the appropriate number of blooms needed to complete the pieces for the wedding: Erica's bouquet, a collar for her "flower girl" Finley (her pup! ), and two boutonnieres. I quote all of my projects by the stem but always make a few additional items in case I happen to think the piece needs them once I start arranging. A couple of months out I finalized the production of all of the blooms and shot Erica some photos. It was at this point she decided to add in the bright orange—which I did with mums. I'm so glad she thought to do this—they made the bouquet in my opinion. As is the case for most of my Paperversary projects, I assembled the bouquet in my studio, wrapped the stems with ribbon, and shipped it along with the other accessories off to Texas. This part is always a little stressful for me, but (knock on wood) so far my absurd engineering techniques have worked out just fine in transit. Here are photos of the final results! I couldn't be happier with how everything turned out, and I can't get over how stunning Erica and her groom, Mario, looked on their big day. I adored working with Erica—honestly—I miss having a reason to email her! (Let's do it again!) It makes me happy to know that she will be able to enjoy her bouquet for years to come and that the investment she made in flowers wasn't thrown away after a few hours. If you have any questions about this project, weddings, or any other type of event, send me a note or comment here.